Why get involved in volunteering for the Cardiff Rivers Group? After a shed full of Bacardi the night before, sometimes it’s good to reflect and remind myself on what drives me to be involved in volunteering for the Cardiff Rivers Group. Last Sunday afternoon (mid-October 2014), Pol and myself wanted to take her daughter, Emma, and her kids, Izzy and Eliot, out somewhere for a walk. Having missed the Forest Farm event due to a charity cycle ride, I suggested that we visit Forest Farm. It’s on our doorstep and before I sent out the details of the event to the CRG volunteers, I had no idea about the area. Apart from the canal and the feeder which I’m familiar with, there were a number of ponds that I didn’t know existed until I looked up the area on Google maps. As a bonus Dave mentioned at the committee meeting, that there was a American Armoured Personal carrier from the Second World War buried there! Being infected by the litter picking bug, I took my hoop, a fresh red plastic bag, gloves and litter picker with us. Emma took her metal detector in order to find a number of buried American tanks (OK, a slight exaggeration). We parked near the conservation centre and set off picking up the odd piece of litter as we wandered around the paths. The paths were pretty clean but in the feeder there were lots of objects like a plastic car bumper that I would have loved to fish out if I’d had waders with me. Without really thinking about where we were headed, we followed a group of other walkers, and soon found ourselves by Radar weir. I showed the kids the secret buried bridge and tunnel and while they explored the small gap left of the tunnel, I headed off to pick up more rubbish by the weir. There was a crowd at the railings by the weir and before long, I could see why. 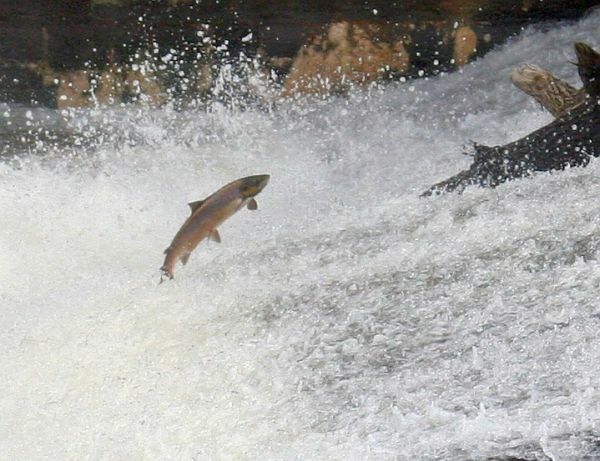 I spotted my first Salmon trying to jump up the weir right alongside the bank. The salmon are obviously a bit thick and didn’t fancy using the purpose built fish pass which probably cost a fortune to install. I quickly mustered the kids and we all spent the next half an hour fish spotting, watching Salmon all the way across the weir trying to jump it. It was a terrific sight. I was wearing my green CRG hoody and carrying my bag of litter. A number of people approached me and thanked me for tidying up. It is always a great feeling to be appreciated by a total stranger. Next, we headed down the Taff trial where I pointed out the solitary piece of tram track that I’d seen featured on the Friends of Forest Farm website. As we walked down the Taff trial, mindful of bikes, we heard a strange noise and saw two Herons, interfering with each other as they passed overhead. To see one of these giants is good, but two together… wow! We made our way to the nearest hide in Forest Farm, retracing our steps where we went wrong. The hide is by one of the ponds where we spotted a photographer with a lens as long as my arm, clicking away. There was a kingfisher, going about his business, picking up his lunch as he flitted from reed to reed. Luckily, we had brought binoculars and were able to watch him (or her) closely. Emma had to take Eliot from the hide as he was a bit noisy and could have scared the Kingfisher away. On the way back, I emptied the contents of my red plastic bag into one of the bins along the canal. Something that Izzy can share with other members of the Coed Glas Primary school Eco committee. Since appearing in a picture in the South Wales Echo on one of our CRG litter picks, Izzy has become a bit of legend in her school for all things “Eco friendly”. Her time with us, and with me on regular litter picking around the park opposite my house in Llanishen, has been a positive effect on her and her friends who see us out and about. I’ve always considered myself well versed and pretty knowledgeable in places to go and see in Cardiff. However, over the past 5 years, since being involved with the CRG, it seems I still have a lot to learn. We often visit places that I never knew existed. Even if I’m familiar with an area, donning the waders and seeing it from within the river, gives you a new perspective. It’s a view of the world as the wildlife sees it. According to the press, the Taff is now the cleanest it’s been for 20 years. I’d like to think that the work we’ve done has been one of the big factors and was an enabler for the enjoyment I got watching Salmon going upstream. I’ve tried to infect my friends and family with volunteering. Most think of me as a bit of a weirdo including my eldest son Nick. I can live with that! With Nick, I have managed to get him out on a litter pick and to one of our beer fests and given him something different to think about (apart from himself, which most youngsters think about). I was really chuffed when he asked me about getting involved in Keep Wales Tidy as a Trustee and I now look forward to hearing tales from Dave, Louise and Rich about their “Nick” sightings in the KWT office. My other son James is proving a difficult nut to crack, but I’m determined to get him out litter picking one day. If all else fails, I’ll have it written into my Will.